So you want bigger pecs, huh? It’s important you don’t stick to just machines, since you want to ensure you’re hitting all the right muscles, from top to bottom, with incline, flat bench, drop sets and super sets. 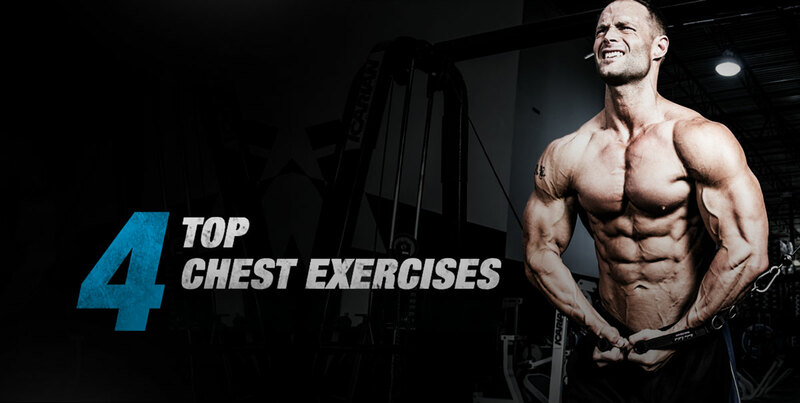 Some of the chest exercises below don’t have a set number of reps; instead you’re asked to train to failure. This requires focus and intense energy, so if you need a bit of support, reach for BPI Sports’ newest pre-workout supplement, 1.M.R™. With all new ingredients and old favorites, 1.M.R™ will raise your energy and stamina through the roof, have your muscles pumped to the max, and have you mentally focused and dialed in, maximizing every single effort you make when you train. It doesn’t just step up your endurance; the extra-strength, ultra concentrated 1.M.R™ pushes you to go past your own limits, taking you to that next level where real transformations happen. Perform 4 sets of each chest exercise, with 15 reps for the incline dumbbell press and work out to failure on the dumbbell fly exercise. Rest only 90 seconds between each superset workout. For the incline dumbbell press, make sure you’re fully controlling the weights when training. Push with your chest, lock arm on top, hold for a second and lower the dumbbell slowly. Try to take twice as long when bringing the weight down. For the dumbbell fly, make sure you have a slight bend at your elbows and lower both your arms in a wide arc until you feel your chest is stretching. Your arms should be stationary, the actual movement happens at the shoulder joint. Breathe in when bringing weights up, breathe out when lowering them down. This chest superset exercise will mainly work out your pecks, but also your shoulders and triceps. When performing this chest exercise, perform the first set to failure with a load that encourages about 10 reps, then lower the weight so that you can do 25 reps. This total workout counts as your first set. You need 4 sets with 90 seconds rest between each one. Starting position: When you lift the bar from the rack, hold it straight over you with arms locked. Next, lower the bar slowly until it touches your pecs. Pause briefly, then focus on pushing the bar up with your chest muscles. Lock arms, squeeze your chest in the contracted position, hold and lower bar again. Just like in the Incline Dumbbell Press and Dumbbell fly superset exercise, it should take you twice as long to bring the load down. Perform 4 sets of this chest superset exercise, performing reps to failure and resting 60 seconds between each superset. When positioning yourself by the cable crossover machine, make sure your torso bends forward at the waist a little and that the pulleys are high above your head. Simply extend your arms to the side in a wide arc until you feel that stretch on your pecs. Keep in mind that you should keep your arms and torso stationary throughout the entire exercise. When returning to your starting position, use the same wide arc. For the cable press exercise, your upper arms should be at a 45-degree angle and elbows should be at 90 degrees. Extend through the elbow, press the handles together straight in front of you. make sure to keep your shoulder blades retracted as you perform the cable press. Pause when your arms are fully extended, then return to starting position. For this last exercise to help you grow your chest, perform reps to failure for as many sets as you can. Give yourself only 60 seconds of rest in between sets. Get into a high plank position, place hands directly under shoulders, ground toes into floor for stabilization, tighten your abs, flatten your back and lower your body. When you perform the pushup, keep your neck in a neutral position and body straight.